Change up your salad routine with more than 100 recipes that will transform your bowl into a satisfying meal. Salads are more than just lettuce. With Salads and Dressings, upgrade from spinach salad and try mixing together a tabbouleh, a spicy Asian chicken salad, or a Mexican quinoa salad. From salads with cheese to salads with seafood, your salad bowl will never be boring again. 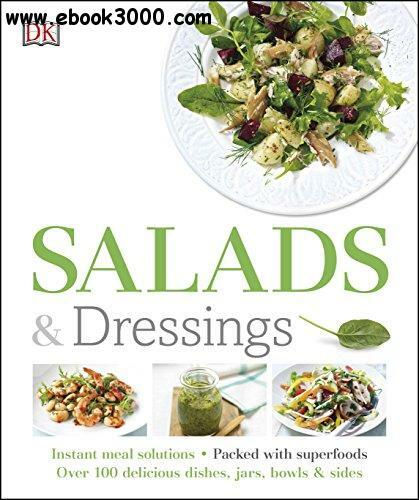 With over 100 easy and healthy salad recipes that feature ingredients like papaya, red rice, and pomegranate seeds, Salads and Dressings caters to the latest foods trends, including mason jar salads and raw foods. Find the perfect match for your salad with the "wheel of salad dressings," and whip up pestos, vinaigrettes, and salsas. You'll never make or eat a bland salad again after Salads and Dressings.